Are you looking for equipment for a fitness facility? 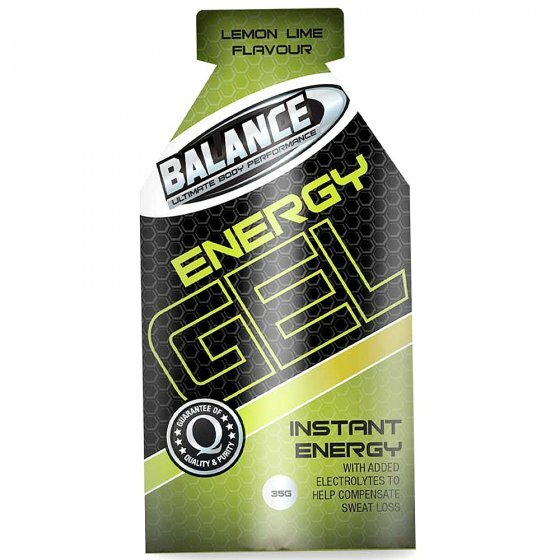 Balance Energy Squeeze gel gives you 25g of pure complex carbohydrate in the form of maltodextrin. This great tasting formula supplies energy fast to help ensure the ultimate performance from your body. Your body burns carbohydrate to provide the ATP (Adenosine Triphosphate) that helps the muscle to perform. Complex carbohydrate energy is stored as glycogen, with 75% stored in the muscles and 25% stored in the liver. Regular replenishment of energy levels is required to support muscle performance. Before Exercise: Best to take with 300-400mL of water per serve. Your body requires 1g of carbohydrate per kg of body weight per hour and for ultimate performance, always maintain your fluid uptake. Your Personal Fluid Replacement Programme: For each kg of body weight lost during exercise you need 1 litre of fluid to replace it. During Exercise: Consume one squeeze gel with 300-400mL of water every 20-30 minutes. Water intake is essential to help prevent dehydration. After Exercise: Consume one or two squeeze gels with the correct amount of water to replace lost carbohydrate. This is a great window opportunity to assist recovery. Always consume 300-400mL of fluid per squeeze gel. Ingredients: Maltodextrin, Water, Preservative (Potassium Sorbate), Flavour, Food Acids (Citric Acid, Ascorbic Acid). Shipping Policy: At Elite Fitness we aim to get your order to you as fast as possible, at a price that won't break the bank. For smaller items, we use Courier Post-delivery and for bulkier fitness equipment we use Mainfreight delivery. Extra costs will apply to rural delivery areas. Dispatch & Shipping Times: At Elite Fitness we aim to be very prompt when processing and dispatching, which usually takes 1-2 business days. Please note that larger items may have a longer dispatch time. North Island: 1-3 business days to deliver after dispatch. South Island: 1-5 business days to deliver after dispatch. North Island: 1-4 business days to deliver after dispatch. South Island: 1-6 business days to deliver after dispatch. *Please note: Rural delivery times may vary depending on the location. Holiday periods may affect delivery time. Auckland Warehouse Collection: Most orders received before 3:30pm Monday – Thursday, can be arranged for collection the next business day by prior arrangement. Contact our Call Centre on 0800 243 834 or for this option. Tracking & Tracing: All orders will receive a Track & Trace reference via email upon the dispatch, so you can track your order to your door. Note: Delivery times will be impacted by statutory holidays as Courier/ Freight companies do not operate on these days. Business days are classed as Monday-Friday and exclude statutory holidays. Convenient, transportable source of 25g complex carbs. Fast absorption – for intense and prolonged exercise. Sustained energy to fuel your muscles from start to finish. Carbohydrate energy to help you perform to your max.